Applying marketing techniques to your product or a service, so you can stand out from your competition and grow your brand using advertising to build brand recognition and a good reputation for excellent service seems very straight-forward. 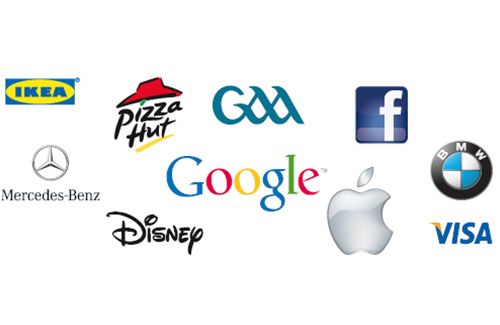 But how do you implement this?Some of the most easily recognisable brands in Ireland and internationally are Google, Visa, Apple, Coca Cola, Ikea, Facebook and the G.A.A. When you see their logo, what emotions and products come to mind? What is their reputation for customer service? Would do you stand out from them if they are the competition?To work on building a strong brand you need to critically look at your business from your company name, logo, tagline that represents your business, premises, signage, promotional material, website, social media, advertising, customer service/reputation and evaluate your current position in the marketplace. Branding and Your Business – Where to start? In today businesses which have been streamlined and lean, it is not always possible to hire marketing executive to develop and implement a marketing plan for your business in-house. As a busy business owner wearing many hats and having a hands on approach there is not always time to plan and decide on where to spend your marketing budget efficiently and effectively. The decisions can sometimes be made for you by local events, festivals and sponsorship. Using this method of advertising and marketing, how does this affect your brand? If you have started to ask yourself the following questions, now is the time to start thinking about your marketing strategy for your business going forward and therefore your brand. Name recognition – is their instant recognition when the company name is mentioned? Is my marketing budget spent wisely? Am I getting a return on investment? Do customers and potential customers know I am sponsoring local events and investing money in the local community? The above questions are only meant as a starting point in focusing on your brand and how you would like to develop your brand for the future. If you would like to discuss your brand in more details, please contact us and we will be happy to arrange a branding working or an evaluation of your brand.